The release of Nike Mercurial Superfly I in 2009 was truly a beginning of something big. Nike had a big launch for the boot at Old Trafford with Cristiano Ronaldo as main character to advertise the new Superfly. The Superfly I was a product of 2 years of engineering and designing, Nike did also work around many professional players feedback to create this boot. The new technology in the Superfly I was called “Flywire”. This Flywire technology allowed Nike to reduce weight without losing strength. You can compare the Flywire technology with cables in a bridge, it supports players foot were needed. The boot weighted only 185 grams and back in 2009 that was very light. 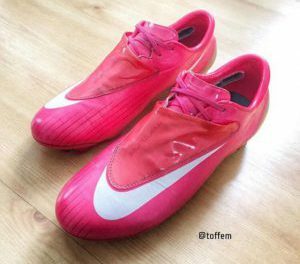 Nike added the Tepex carbon fibre soleplate to the boot which really made the Superfly I unlike any other boot on the market. Nike released a very limited edition of the Nike Mercurial Superfly I Fg called “Wear It Proud”. They were originally made for Ugo Moyne and the English rugby team to celebrate their new purple away kit. Each boot was handmade in Italy and individually numbered from 1 to 70. Rumors tell that 30 pairs were given to the rugby team members and only 40 pairs sold to public. My pair is numbered 55 out of 70.